Hilary Duff Begins Filming 'Younger' Season Five in NYC! Hilary Duff takes a break in between scenes of the upcoming season of Younger on Tuesday morning (February 20) in New York City. 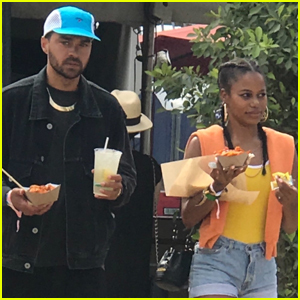 The 30-year-old actress looked super chic in an all black outfit as she spent the morning kicking off production of season five with co-star Jennifer Westfeldt. Later that day, Hilary changed into a peach-colored blouse, floral print skirt, and heels for as she finished up her last few scenes for the day. 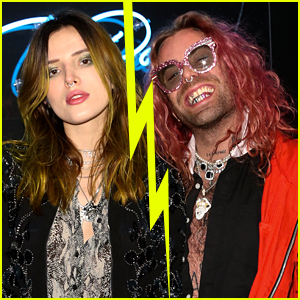 As of right now, the premiere date for Younger season five hasn’t been announced yet. Jennifer Morrison Stands for Equal Rights Now! Jennifer Westfeldt keeps it chic and sophisticated while hitting the carpet at the opening night performance of A Parallelogram held at The Second Stage Theatre on Wednesday (August 2) in New York City. The 38-year-old actress-director, who recently exited her hit ABC show Once Upon a Time, was joined at the event by Katie Finneran, as well as the stars of the show Stephen Kunken, Celia Keenan-Bolger, Anita Gillette, Juan Castano, Carole Rothman, playwright Bruce Norris and director Michael Greif. “I stand for #equalrightsnow with Gloria Steinem and Dorothy Pitman Hughes! Support the ERA COALITION and help get constitutional equality for all by purchasing this limited edition tee at http://represent.com/equalrights,” Jennifer captioned with her Instagram post, featuring her rocking a #equalrightsnow t-shirt. Dakota Fanning looks super chic while stepping out for the Through Her Lens: The Tribeca Chanel Women’s Filmmaker Program cocktail party on Thursday (October 27) at the Smyth Hotel in New York City. Also in attendance at the party were actresses Jennifer Westfeldt and Louisa Krause. It was just revealed by TMZ that Dakota and Elle Fanning‘s parents – Steven and Heather – are getting a divorce after almost 27 years together. Steven filed the papers and cited irreconcilable differences. FYI: Dakota is wearing a Chanel dress. Katie Holmes, Sienna Miller, and Ruth Wilson pose for photos while attending Through Her Lens: The Tribeca Chanel Women’s Filmmaker Program Luncheon on Tuesday (October 25) in New York City. The ladies were joined at the event by Olivia Cooke, Mamie Gummer, Rashida Jones, Jennifer Westfeldt, Gillian Anderson, Emily Mortimer, Carmen Ejogo, and Zosia Mamet. While they have never publicly addressed their rumored relationship, Katie and Jamie Foxx have been the subject of split rumors this week. “They are for sure still together,” a source tells Us Weekly of the reports. 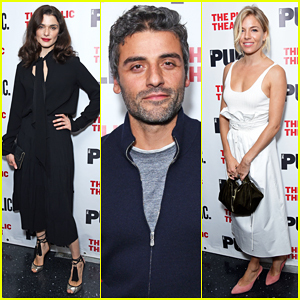 Sienna Miller & Oscar Isaac Support Rachel Weisz At 'Plenty' Opening Night! Rachel Weisz keeps it chic and sophisticated in black while attending the opening night celebration of her new play Plenty held at The Public Theater on Thursday (October 20) in New York City. The 46-year-old actress was joined at the event by her co-star Corey Stoll and his wife Nadia Bowers, as well as Oscar Isaac, Sienna Miller, Anna Wintour, Jennifer Westfeldt and Colman Domingo, who all came out to show their support. Plenty is the story of Susan Traherne (Rachel), a fiercely intelligent British secret agent flown into France during the second world war. Susan’s experiences among her war-time colleagues and over the two decades that follow are distilled in powerful scenes in this endlessly layered work about a woman of remarkable bravery, who cannot find in peacetime the values and relationships she cherished in war – Buy tickets here! FYI: Rachel is wearing Pierre Hardy shoes.